Cake Unappreciation Day | sara, darling. Me: Dear, do you know what tomorrow is? Me: It’s National Doughnut Day*! Me: We don’t ask why when it comes to doughnuts, dear. We just eat them. *National Doughnut Day, not to be confused with National Doughnut Appreciation Day, which is November 5th. I’m not entirely sure how you have a national holiday without appreciation, but nevertheless WE DON’T ASK WHY. See above. 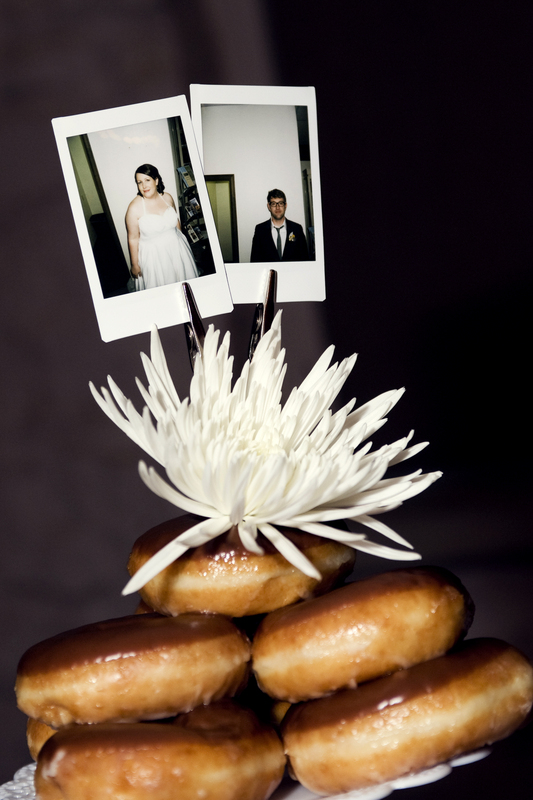 *That is our wedding cake above, made entirely of chocolate glazed doughnuts. Why? HAVE YOU NOT LEARNED YOUR LESSON? We don’t ask why! A. I love doughnuts. Chocolate glazed are by far my favorite, and I will love them eternally. My road to heaven is paved with doughnuts. B. We’re not the biggest fans of cake. Now, I’m not going to turn down a good piece of cake, because that would be crazy-making, and my 4,368 attempts at avoiding desserts and thus wanting to kick everything/one in sight can testify to that. However, on the dessert-hierarchy, cake is maybe 4th or 5th on the list, depending on season. And nobody serves my favorite cake anymore, yellow cake with chocolate frosting. And the Boy’s favorite cake is way too complicated (German Chocolate) to make. Betty Crocker, I am not. C. It was CHEAP. Enough Krispy Kreme doughnuts to make a Towering Cake of Doughnutness (or TCOD, as I will cringe-inducingly call it) = $100 plus a drive to Denver. Wedding Cake? Like, 9 billion dollars. Or thereabouts. D. I really, REALLY, really love chocolate glazed doughnuts. My roller derby name might actually have a double-meaning to include a tasty french doughnut. Unintentional, but welcomed. The Boy’s friend Justin LOVES wedding cake (referring to it as if wedding cake were an actual kind of cake instead of just a category). He had gone to several weddings prior to ours in 2010 that all had cupcakes instead of wedding cake, much to his disappointment. When he received the invitation to our wedding, he mentioned to the Boy’s dad that he was really looking forward to our wedding because if anyone would have cake at their wedding, surely it would be him. Imagine his surprise and anguish at our beautiful doughnut cake. A few weeks later, the Boy’s dad had a small, red-velvet ‘wedding cake’ made up just for him and sent it to his business. ← About the Dog: One Imagined and One Real Conversation.